Since 1986 the creation of art that celebrates memories of place is what we do at Hestia Creations. 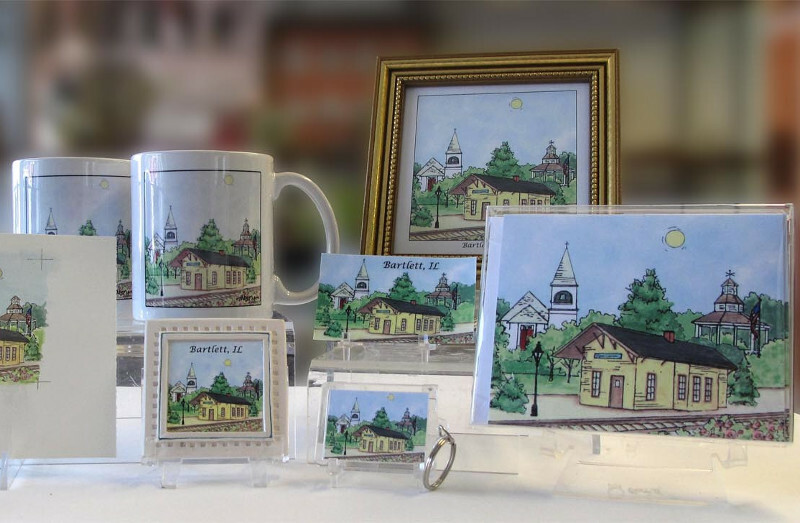 From our AmeriScape ornaments and VillageScape building miniatures to our Hestia Impressions original watercolors, we create beautiful products sure to captivate your customers, guests, donors, volunteers or clients. We have the knowledge, experience and expertise to help you create the perfect product for your shop, inn, restaurant, community organization, museum, church or school. Every community has history, traditions and buildings that make it unique. Our products help our customers celebrate and promote that uniqueness. Our sales experts, working with our talented studio artists, can help you take an idea and make a product that no one else can offer. From the idea, we design your product. The design process is completed in two steps. First a black and white sketch of the the concept is made, then a three dimensional prototype is created in your chosen product line. You approve each step in the process. Only after final approval of your prototype is the order placed. Depending on the product the whole process takes from 6 – 16 weeks. Many of our customers have created an annual product with us — some for over 10 years! Our customers include gift shops, hospitals, churches, schools, main street associations, chambers of commerce, inns, restaurants, and many other types of organizations. Our design fee and order minimums are reasonable making it easy to offer any or all of these unique and beautiful items. Art you can hold in the palm of your hand. Once the design phase is completed, each ornament or building miniature is individually handcrafted and hand-painted by the artisans in our production studio which is located in the historic Mexican artists’ colony of San Miguel de Allende – a UNESCO World Heritage Site. Each customer order is then shipped to our studio in Marblehead for quality control and final packaging. The studio artists in quality control carefully check each ornament against the master so you are assured of the highest quality product. The packaging for these products is custom produced for us. The ornaments are packaged in a gold box and building miniatures a special clear scratch resistant plastic box — either of which make an enticing display. Bespoke products featuring original art by Hestia’s own studio artists. Each custom, original watercolor comes from the easel of one of our studio artists. They take your thought, idea or photograph and transform it into exclusive artwork which can be printed on a wide variety of carefully curated promotional products like coffee mugs, coaster sets, trivets, notecards, keychains, and more. Each of our finished Hestia Impressions Products is a piece of art which is sure to engage and delight your customers. Inspired by the American Folk Art Tradition and the French Santons. Our museum quality Companions Collection Nativity is beautifully designed and carefully handcrafted by our talented studio artisans. Each figure, animal and accessory is molded of bonded marble dust and painted by hand. Gorgeous textural detail is carefully curated and added to each piece for a realistic and historically authentic feel. Our Nativity is cherished by collectors and is featured in many collections including the large one at the University of Dayton’s Marian Library. Our Nativity collection is a distinctive way to share the magic of the Christmas story with your loved ones and friends. Your customers are sure to appreciate the quality and uniqueness of our Companions Collection Nativity.